ETIC "School of Information and Communications Technologies " offers a variety of professional degrees certified BTS and BTP level. The BTS "High Technician Certificate" is an approved diploma of professional training. The training of BTS is spread over 2 school years each one in 10 months. To give a degree of high Technician of baccalaureate +2. The BTP «Professional Technician Certificate» is an approved diploma for vocational training. The training of the BTP is spread over 2 school years each one of 10 months to give a grade equivalent to the baccalaureate and which allows to continue your formations to have a BTS. 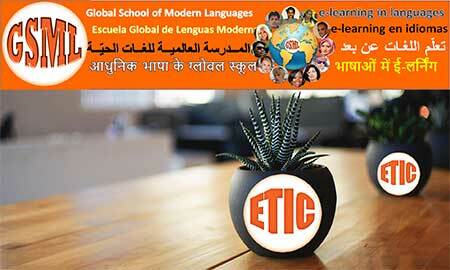 ETIC offers courses combining theoretical courses with practical predominance and especially internships in companies. The content of the courses is regularly reviewed and innovated to suit changes in the professional sectors and the needs of companies, which gives them flexibility and competence in the job market. The specialties are chosen by the care of competent educational executives with more than 30 years of experience in the field of training to offer you the best training for a better future. Today, with globalization, it is important to learn one or more foreign languages. Indeed, with the opening of countries on each others and using the new information technologies, the diversification of foreign language skills has become a necessity. This promotes trade and international mobility. These are also real advantage on a resume, which promote the chances of recruitment for candidates.